Photo Calendar Creator lets everyone make beautiful calendars for any year in the future. The full version comes with hundreds of ready-to-use templates and allows you to print your designs in professional quality. Special offer! Order any version at 30% OFF until April 30, 2019! Make calendars of any type - wall poster, desktop, pocket, spiral-bound, booklet, monthly or weekly planners. Have a quick start with 100 design templates and dozens of month styles! Choose backgrounds from the built-in image gallery and add your pictures to grid cells for a personal touch. Get access to numerous features that let you create truly personal designs. Make calendars with photo collages and display moon phases in the month grid. Create your own holiday groups and recurring events. 200+ ready-to-use calendars templates are there to get you on the creative track. Create premium quality calendars that can be distributed commercially. Send calendar layers to Photoshop if some extra editing is needed. Make bilingual calendars popular in multicultural communities. Export multi-page projects to PDF, or save as TIFF CMYK for professional printing. The order process is totally easy and takes just a minute or two. All transmitted data is protected, so you can be sure that your credit card or PayPal information is completely safe. Offline payment options such as bank transfer are available too. Get started with your new software immediately after purchase! You will receive a registration email with download instructions and the license key within 10 to 15 minutes after the payment is processed. 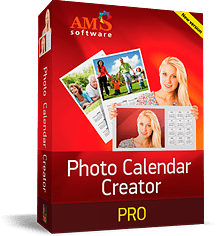 Photo Calendar Creator is incredibly easy to use, even for the non-tech savvy. However, our support team is always there to help if you have some questions while working with the software. Visit our Customer Support Center - our team will be happy to help you!